We were drained, we were tired, we were spent. We had given all our energy to TVXQ and the red ocean. And then… we were greeted with an oasis in the midst of the city for our distraught souls. The night before, we had decided to go to check out LaQua Spa (next to Tokyo Dome) because supposedly they had so many therapeutic things in their waters, and because you could stay there overnight and we wanted to try staying overnight at an onsen once. So we went forth into the rain, entering the lift, and when the doors open, a quiet lobby greeted us. Shoes off, following the other silent people to the counter, we were greeted with friendly concierges who gave us a locker key and directed us to another counter inside the ‘women only’ area. We had to choose between three designs, and having chosen an orange top-and-pants combo (sadly, they had no yukata option) in a bag with towels, we got changed and had a bit of an exploration. The Spa complex had three levels; levels dedicated to onsen and bathing, levels dedicated to sleeping and resting and lounging about, levels with food, with massages, with treatments. It was all very modern and high-class hotel feeling, and people were polite and stayed quiet, not wanting to disturb their neighbours. But since the whole point was soaking our souls away, we went back to the locker areas, stripped, showered, and got into the baths. The water was gloriously hot. The water was slightly salty from the minerals. The steam made everything softer and more welcoming. I never wanted to get out. It wasn’t my first time in an onsen, but it never gets old, bathing naked with a whole bunch of other naked women in waters that are supposed to purify your skin and all that, with everyone just minding their own business and not intruding in anyone’s space. LaQua had an indoor and outdoor area so we tried both (the outdoor one had really hot water, so we went back inside pretty quickly), there were sauna with different temperatures from 45, to 70, to 90 (the 70 was the best, the 90 one was actually an oven), and little things like cold baths and mist showers and stuff made everything better. And when we decided to get out and get dressed, the spa had hairdryers and lotions and moisturisers and heat-protective sprays. There were even cotton buds and cotton pads to guarantee that you could look after your skin and hair after your bath to make sure you end up looking like perfection. The next day, when we made our way out of LaQua, still half asleep and trying to figure out our next move, we realised that more people stayed overnight at the place than we thought. A lot of office workers and middle-aged women were there, making their way out of the onsen with neat suits and cleaned-up hair. Or maybe they got to LaQua early in the morning, and prepared for their day by soaking in the baths. But who knows? If you ever feel like spending a night somewhere comfortable and relatively cheap, just go to LaQua. They actually have everything you need, and it’s worth the experience. Legend has it that poet gained his name because he was found at the foot of a kaki, or persimmon, tree as an infant and subsequently adopted. As an attendant of Emperor Monmu, the grandson of Empress Jitou (the poet of No. 2), Kakinomoto no Hitomaro had plenty of opportunity to demonstrate his poetic prowess. He definitely showed off his skills, because he became known as one of the great poets of early Japan, and after his death was deified as a god of Poetry, complete with temples dedicated to his name. 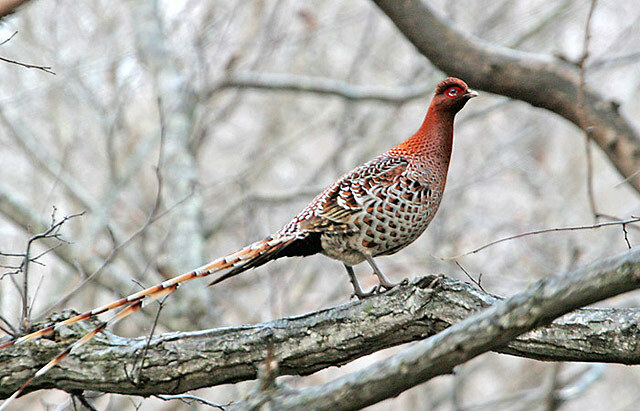 In this tanka, the translation notes merely say that the night will seem to be as long as the tail of the copper pheasant if he cannot be with his lover tonight. However, the fourth line can be interpreted as also ‘To drift, like my life’ instead of ‘So long, like this night’. If you add that interpretation into the poem, then instead of just being just a pining lover in the night, the poet could be instead yearning for a companionship in his life of solitude. Even though both interpretations are about longing for a lover in a relationship, I personally like the second interpretation about drifting in life. Because it’s true. If a person lacks companionship, whether it be a lover, or a partner, or a friend, or family, then regardless of how introverted a person may be, life will seem long and dreary. Without anyone to share with, or any person to rely on, nights would seem long, and life would drift like and flow just like the tail of a copper pheasant, in solitude as it follows unquestioningly the pheasant, without its own purpose, without its own meaning.